Water Stone and Light is describes my ongoing work with sea and shore. I have made work about other landscapes but in the final analysis I am most moved and inspired being beside the sea in remote places. On the West coasts of Ireland and Scotland and the Scottish Islands there is a fragile “wilderness”. Walking on beaches, slowly filtering the visual material at my feet and to the horizon provided me with rich source material. In such moments I feel totally connected with the earth and my work is derived from those moments. 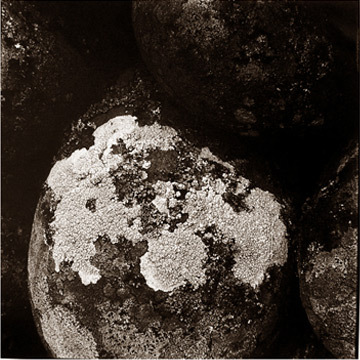 The work, building on themes developed over thirty years, tries to find the awe inspiring in that which is easily passed by and contains issues of fragility, beauty and transience in the landscape; marks and scars left by man and the potential threat to the few remaining areas of “wilderness”. Looking at the micro and thinking about the macro.